Calgary is a region with its own inimitable expression of weather; experiencing startling winter conditions even after a sunny moment, and not forgetting the notorious chinook. However, and surprisingly enough, many tree species have thrived in such environments. To put this into perspective, tens of thousands of fruit bearing trees have existed in Calgary, blessing folks with the benefits that come with them like edible, healthy-rich fruits. There are many other fruit trees that grow well in Calgary but we think an apple trees will give you the largest yield of all fruit trees. There are a number of apple trees that can thrive in Calgary and become options for homeowners to ponder on. If you enjoy eating apples, here are some of the apple plant trees that do well in Zone 3 climate. Norland apple tree is a multicolored tree in itself; with its leaves and flowers changing colors on seasons. It is one of the best eating apple trees to grow in Calgary. At the start of spring, its flower buds blossom in pink and midway, the buds turn into white flowers with pink overtones throughout the branches. Also, in fall, their green pointy leaves become yellow in colour, hence showing you how your yard can’t lack in color and bliss year round. With the help of pollinators like bees, the deciduous tree bears chartreuse crunchy apples in early fall, which are usually characterized by a red blush when ripe. Inside, the crispy apples are white in color. Since they are great producers, it is prudent to pick them as early as possible before they ruin the yard and walkways. The Norland apples can also be prematurely picked before ripening as they can be stored well. They can be freshly eaten or cooked. Notably, when growing the Norland apple treein Calgary, provide sufficient sunlight, space for spreading and a moist condition. The Prairie sensation is a new type of apple available in Calgary. It finds its origin In the University of Saskatoon where it was developed to endure the severe prairie climate. However, its flowering and foliage characteristics are still similar to that of Norland apple tree. The also deciduous plant tree produces crispy apples in large amounts between late summer and early fall. The apples are usually red with a crimson, green blush. Inside, they have sweet white juicy flesh. These apples are usually of high quality and perfect for fresh eating, cooking and baking. The apples produced can be as large as 8.5 cm in diameter. To ensure growth of such large sized apples, pruning and thinning of the tree is important. Also, since they are generously produced, it is wise to pick them and store them before they fully ripen. This will similarly prevent the yard from being messy because of fallen apples. Since the apple tree is of high maintenance, it requires a second pollinator. When growing in Calgary, it should be provided with full sunlight, moist conditions and space for spreading. This is another bountiful apple treethat is great for your orchard in Calgary. Goodland apples have excellent edible qualities being characterized by light green color and round shape. Sharing the same overtones as the Norland apple tree throughout the seasons, it yields fleshy white apples between late summer and early fall in plenty. The apples are usually of good size (6-8 centimeters in diameter) and can be stored up to 20 weeks in a cool dry place. The crispy, flavorful Goodland apples can be freshly eaten, cooked or made as apple sauce. In Calgary, they serve as recipes when making sweet side dishes or homemade desserts. This is another hardy apple that comes to life in mid-September in Calgary. 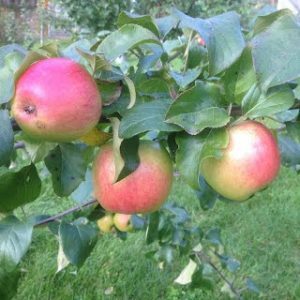 The Winter Cheek Apple tree is a variety that is disease resistant and shares same features as the Norland apple tree all year long. The winter cheeks apple are red in color. They are also very fleshy, crisp and sweet making them edible when fresh. Furthermore, they can be of use when cooked or baked. Their edible qualities make them idea for such purposes. Going by the name, Alberta Gold apples are usually goldish in color or preferably yellow. If you are a fan of gold-lit thing, this is for you. The Alberta Gold produces crispy apple fruits that taste juicy and sweet to the tongue buds. The Alberta gold apple can be enjoyed as fresh fruits and can also be cooked. The apples can be picked and stored for 12 weeks under cool and dry conditions. Though the name may seem techy, this is another natural apple tree that can grow well and produce fruits in Calgary. M360 apples are also juicy and sweet and ideal for desserts such as apple pies. The M360 apple trees produce fruits that can be stored for as long as six month. There are many other trees to choose from for the best eating apple trees in Calgary. If you looking to eat healthy apples year in and year out while keeping the doctor away, consider the apple trees above which well in Calgary. They will also prove worthwhile as attractive features in your garden. Visit our trees Calgary gallery to view more trees that grow well in Calgary.